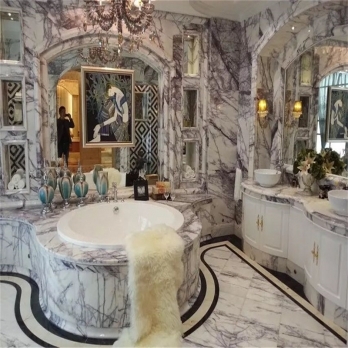 1) Usage: indoor & outdoor walls, floors, countertops, vanity tops, decoration, tombstone, etc. 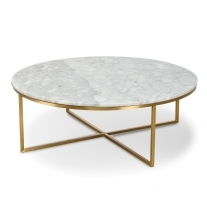 2) Finishing: polished, honed, flamed, antique, acid wash, picked, mushroom, bush hammered, etc. 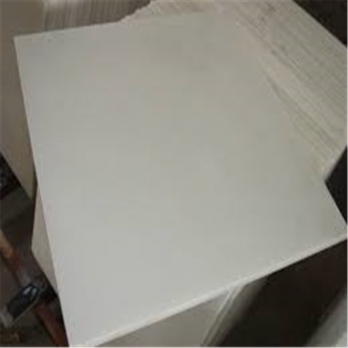 Guangxi White marble tiles in stock Guangxi White marble-Italy Carrara white texture Guanxi white marble is a white marble from Chinese original,which this Chinese white marble from blocks to project products, it can be the wall tiles, flooring tiles, big slabs, random slabs,countertop,vanity tops, table tops,bath accessories, garden carvings,mosaics tiles, water jet medallions etc,which suit for both architects and designers. 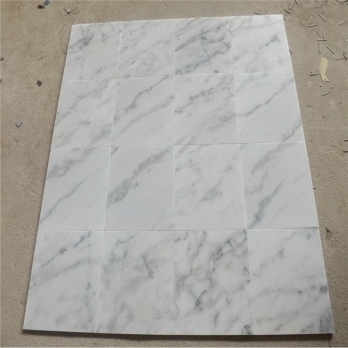 Guagxi white marble is a white marble from Chinese original,which this Chinese white marble from blocks to project products, it can be the wall tiles, flooring tiles, big slabs, random slabs,countertop,vanity tops, table tops,bath accessories, garden carvings,mosaics tiles, water jet medallions etc,which suit for both architects and designers. 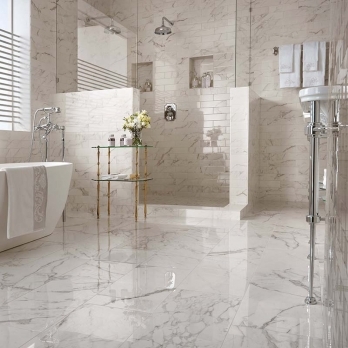 Honed carrara marble floor and wall tile is a pristine white granite, reminiscent of a fresh winter snowfall. 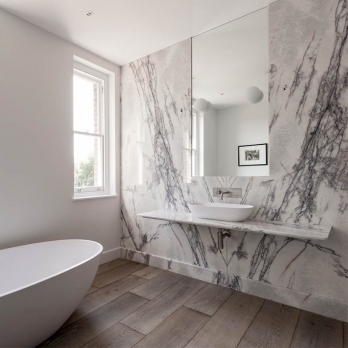 This veiny natural stone is perfect for all applications, including kitchen countertops and bathroom vanities. 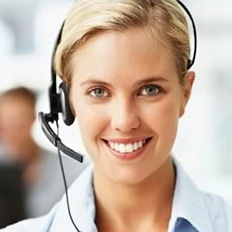 Product No. 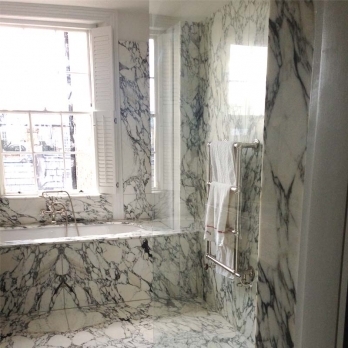 : carrara marble tile Surface Finishing: Polished, Honed, Flamed, Sandblasted, Grooved, Inclined, Stripped, Bush-hammered, Tumbled, Antique, Brushed, Picked, Splitted, Rough, Sawn, Water-hydraulic, Acid-wash, Mushroom, Water-repellent, etc. 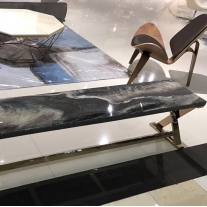 Popular Edge: Full bullnose, Half Bullnose, Bevel top,Laminated Bullnose, Ogee edge, dupont edge, Beveled processed and polished or others. 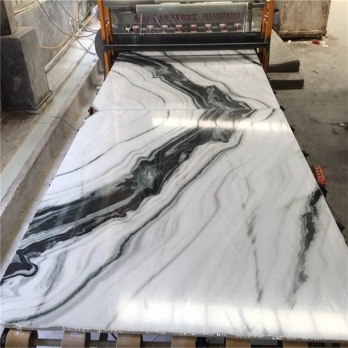 Popular Sizes: A) slab: 250up*60up*1.8cm or 150up*170up*2cm , Customerized etc. 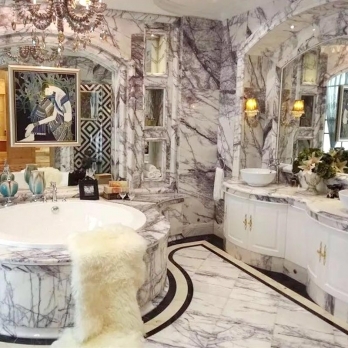 B)Tile:Customerized. 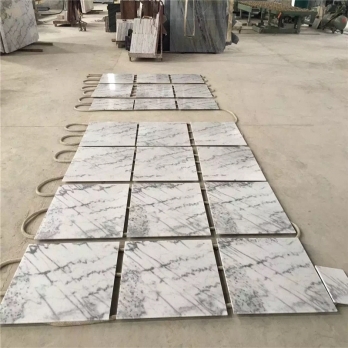 Quantity: 1.Confirmed Every Details Before Make the Rough Production; 2.All Products were Checked by Experienced QC Before Packing Thickness tolerance: ±1mm ±2mm Packing 1.Tiles in carton then to wooden crate; 2.Slabs in fumigated wooden crate. 3.Countertops padded with foamed plastic and packed in strong wooden crates, reinforced with metal straps outside. 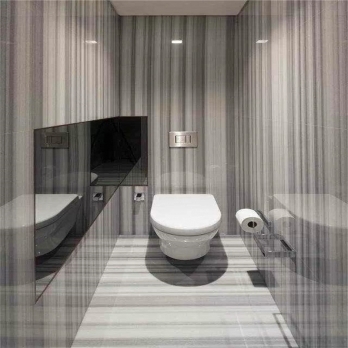 Usage: Floor tile,wall cladding, kitchen countertop, vanity top,window sill, ect. 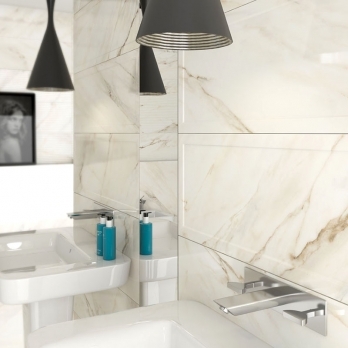 Marble white carrara tile is one of our most popular stones for bathroom vanities and other low traffic areas, like wash stations, bulter’s pantry and baking areas. 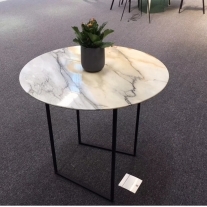 If you are looking to add a sophisticated and luxurious look your home or business, there is no other countertop material the elegance of marble. 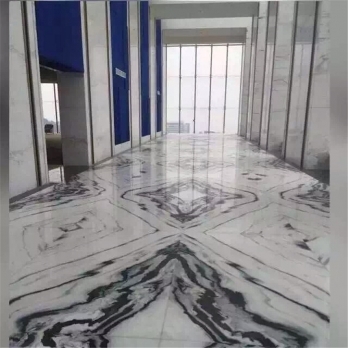 The han white marble from Sichuan province China, also name jade white marble,The jade White Marble suitable for bathroom wall tiles, flooring Tile,vanitytop,Countertops for interior project,we can supply products of big size s slabs, tiles, Skirtings, Window sills, Steps & Riser stair, Kitchen countertop,Vanity tops, Work tops, Bollars, columns, Curbstone. Paving stone, Mosaic & Borders, Waterjet medallion etc. 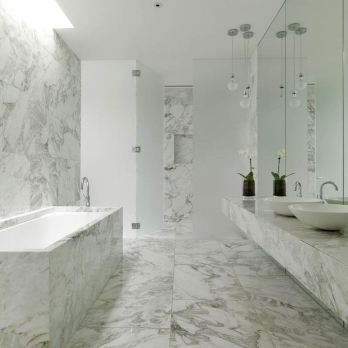 Hotel bathroom white carrara polished marble wall tiles is an elegant and pristine marble. 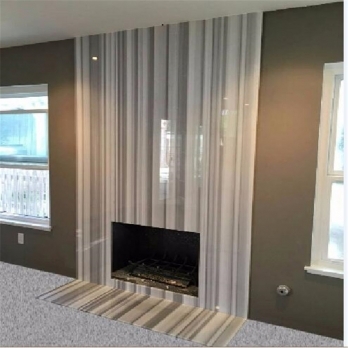 It is the perfect natural stone for adding sophisticated style to master bathrooms vanities and showers as well as fireplace surrounds and low traffic kitchens. 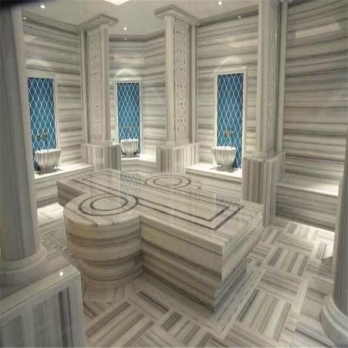 Milas Liac white marble original from Turkey,which is the white marble with the natural purple veins, the special variety veins suit for interior decoration designs,Milas Lilac Marble turkish, available natural stone slabs, wall tiles, flooring tiles , bookmatch wall slabs available, Milas marble popular used in bathroom wall tiles, countertop, lobby background wall, Milas Lilac marble bookmatch is the best choices. 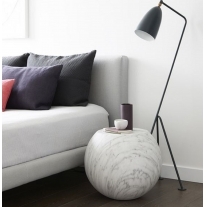 Milas Lilac Marble;This sample shows the general characteristics of the variety veins, Lilac white marble is products of nature and will vary in color, marking and texture. 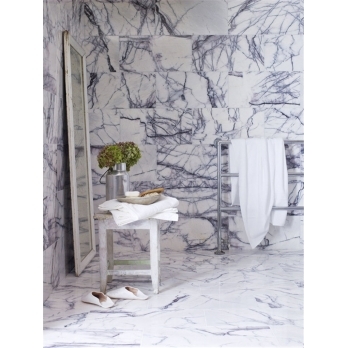 Milas Liac white marble original from Turkey,which is the white marble with the natural purple veins, the special variety veins suit for interior decoration designs,Milas Lilac Marble turkish, available natural stone slabs, wall tiles, flooring tiles , bookmatch wall slabs available, Milas marble popular used in bathroom wall tiles, countertop, lobby background wall, Milas Lilac marble bookmatch is the best choices. 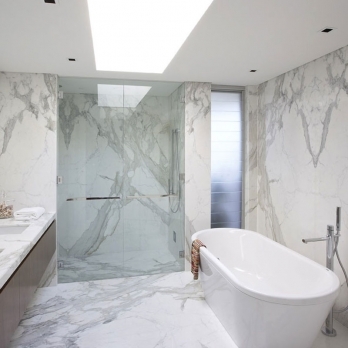 White Carrara Marble is a popular white stone from Italy that is a consistent, light natural stone with dark grey veins. 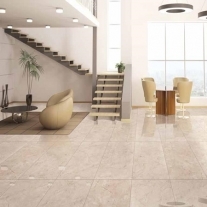 It's a superior unmatched elegance to your household. 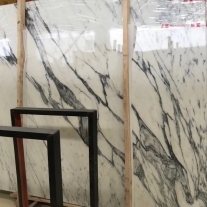 Milas Lilac Marble;This sample shows the general characteristics of the variety veins, Lilac white marble is products of nature and will vary in color, marking and texture. 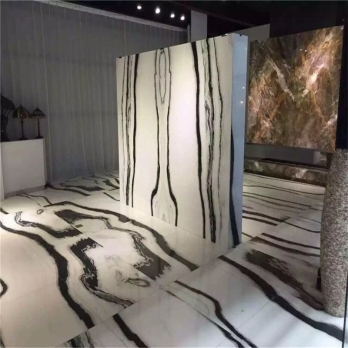 Chinese Panda White Marble; also name Dalmate marble, which is white marble with black Veins marble,this marble can do bookmatch designs for the wall decoration. 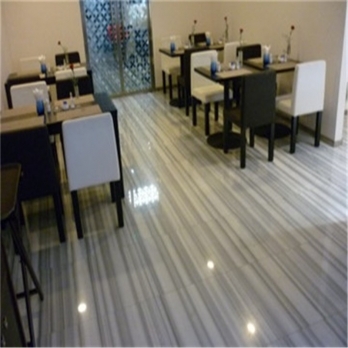 Modern interior designs polished pandaw white marble flooring and wall tiles,which can use for bathroom,kitchen,benchtop,vanity top etc.